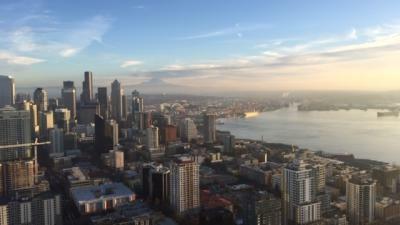 Many do not have as much of a desire to be a tourist in their home city, but I think many “Seattleites” have yet to see how much our city offers. From the spectacular city views, to the many places to eat, to the many fun places to take the most awesome “selfies”, it’s always good to get up and get going when there’s the chance! For all of you that are not from Seattle and are planning to visit, there is just so much for you to do. Here’s a snapshot of my little adventure I went on recently. 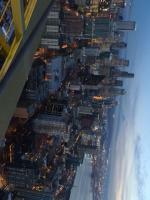 I have not been to the Space Needle in my 21 years that I’ve been living here, surprisingly enough. So my experience definitely exceeded my expectations. 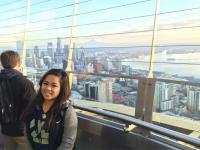 Around 3 PM, we arrived to the Space Needle to check-in. Nice, smooth check-in with the agent, and then we worked our way to the elevators that would bring us up. At the entrance, there’s a nice photographer offering a complimentary photo (which I heard a few years ago, used to be a charge), and once the picture’s taken, you’re given a ticket that you bring to the top to view. The cool thing about the photo kiosk once we got to the top, was that it allowed us to view our photo and change the background of it. Here’s what we ended up with. 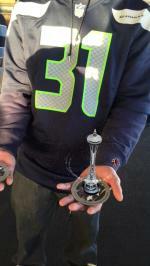 Before we got up, when we were in line, a nice gentleman was holding a tablet encouraging us to download the Space Needle app, to give us a more virtually interactive experience. 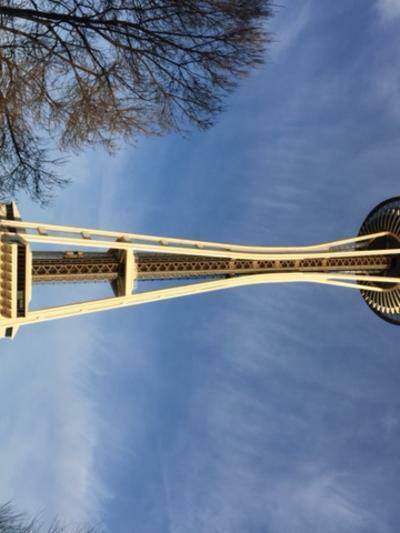 There were cool “space spots” all around the needle where you would open up the app on your device, point the camera at the space spots, and a life size needle would pop up on the camera, which was very cool for pictures. There were some other cool interactive space spots as well, and these varied all around. After we walked all around the inside of the top of the needle, where we found a whole bunch of interactive activities and fun facts about the history of the needle, and information about the structure, we figured it was time to step outside and experience the view from the top. What we saw next was absolutely breathtaking! I think we chose a perfect time ago, we went about an hour before sunset, so we saw the view from the top with some sunlight, then as we watched the sun go down, we waited for all the city lights to come on, and it was as if we were experiencing a whole other city. It is absolutely gorgeous at the top. We ended the day with some sushi and drinks at Ohana’s in Downtown Seattle, a very good Hawaiian AND Japanese restaurant, and took advantage of their happy hour. 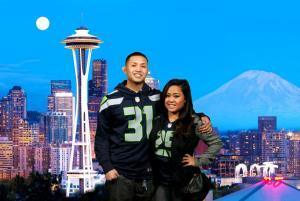 Afterwards, we took a stroll along the streets of Downtown Seattle and saw the nightlife come alive. Street performers, fun unique and local shops, and also stopped by one of the rails that overlook the waterfront in order to take in one last breath-taking view. Although I’ve lived here my whole life, I don’t think I’ve experienced this beautiful city enough, and am so glad that I took a few hours of my time to do so!